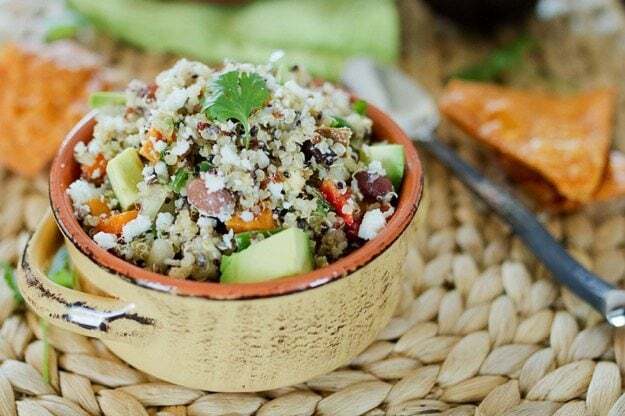 This spiced up Southwestern Quinoa Salad with roasted sweet potatoes, black beans and avocado makes for a quick and easy meal or flavorful side dish. For whatever reason Isaac and I have been on a serious Mexican kick lately. 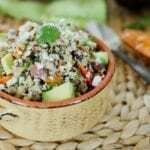 We’ve been loving old favorites like my Quinoa Fiesta Bake and these Clean Eating Taco Salad Bowls, but I’ve been whipping up a few new recipes as well. For New Year’s Eve I actually made two Mexican-themed dishes for the party we attended — the first is this Southwestern Quinoa Salad and the second is a layered dip that I’ll be sharing in a week or so. Get ready. 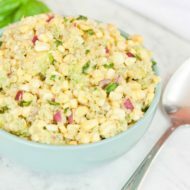 We’ve already made the quinoa salad multiple times because it’s crazy good, super easy and makes for an awesome make-ahead lunch option. 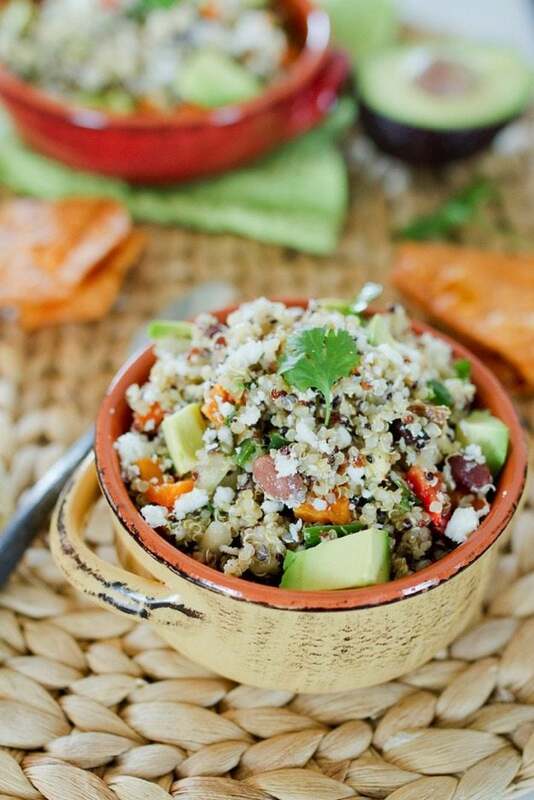 If you like this quinoa salad, I have a full roundup of quinoa salad recipes. 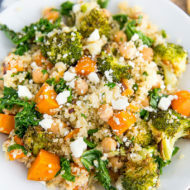 It’s basically a Mexican take on my favorite Roasted Sweet Potato, Kale and Quinoa Salad. Roasted sweet potatoes and quinoa are still involved, I just nixed the kale and added a bunch of other goodies like bell pepper, beans, avocado, cilantro and spicy seasonings. Mark this down in history because you’ll almost never see me take kale out of recipe! If you’re a fan of fresh Mexican food, you’re going to LOVE this! Like I mentioned, it’s a healthy make-ahead lunch option. You can prep everything on Sunday and have lunch for a couple days. If serving it for lunch, it’s got plenty of protein and healthy fat to hold it’s own, but as a volume eater I like serving it over a bed of greens. It’s also a great as a side dish —perfect for parties (you could even bring tortilla chips for dipping) or served alongside roasted chicken or blackened seafood. I topped it with queso fresco because we had some on hand, but it’s totally optional. If you pass on the cheese the salad is dairy free and vegan. Enjoy! 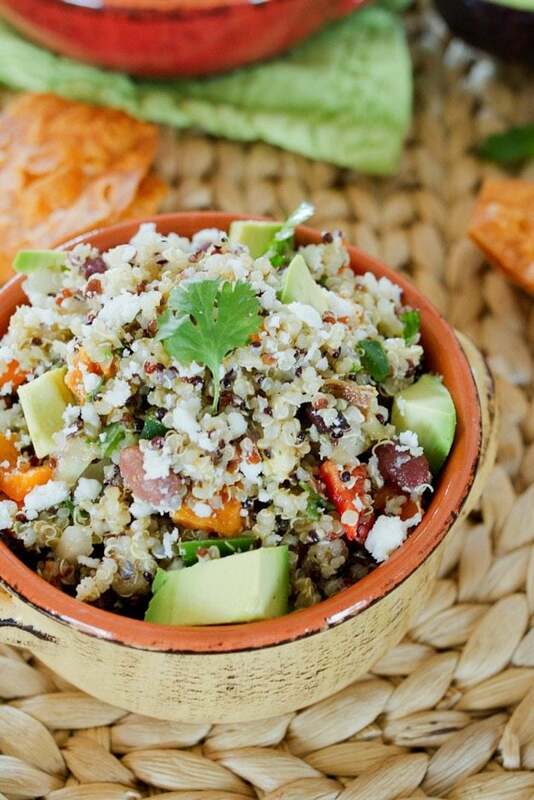 A flavorful and healthy southwestern quinoa salad with roasted sweet potatoes, black beans and avocado. Toss sweet potato chunks with 1/2 Tablespoon of olive oil, season to taste with salt and pepper, and arrange evenly on a baking sheet. Bake in the preheated oven until the sweet potatoes are tender, about 25-30 minutes. Allow sweet potato chunks to cool. Meanwhile, cook the quinoa according to package instructions. Allow quinoa to cool. 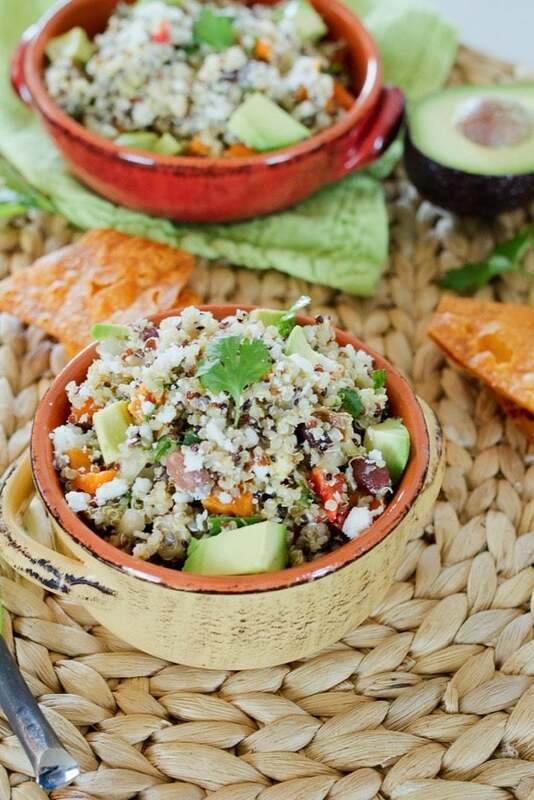 In a large mixing bowl combine quinoa, roasted sweet potatoes, bell pepper, black beans, shallot, cilantro and avocado. Add 1/4 cup olive oil, lime juice, chili powder, cayenne, cumin, black pepper and sea salt. Gently toss the salad to combine. Taste and adjust the seasoning, if necessary. Serve salad right away or chill in the fridge a few hours before serving. Add a sprinkle of queso fresco or feta cheese when serving, if desired. That looks delicious. Thanks for sharing your recipe. Have a terrific week. Delicious Brittany! I love all your salad recipes so I’ll be having me this one too. (Although as it’s currently -5 here in Scotland, I might wait a few month until it’s warmer 😉 ) Pinned! 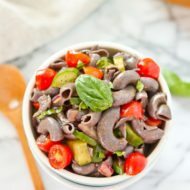 I make the one with kale all the time, so will definitely give this one a whirl! Thanks. Just made this as a side to turkey burgers and it is AMAZING! The colors and the flavors are incredible. It’s 75 degrees out in Kansas City and this salad just made it feel like summer!